This weekend saw the long-awaited release of the new Ambot kit and naturally I bought a brace of these glorious beasts and set aside a couple of hours to get them built. As I was doing so it struck me – alas slightly too late to take WIP shots – that this might be of interest to fellow Necromunda fans so here’s a few early thoughts on the models from someone enthusiastic enough to grab them straight away. Like most people I was expecting this model to be a big, expensive, lump of Forgeworld resin so getting a plastic kit instead was a really nice surprise. Rather than sticking religiously to the same set-up as the studio models for fear of ruining a ludicrously pricey model one can relax a little and adjust things as you see fit. To begin with I wanted to stick fairly close to the design of the originals as they’re cracking models in and of themselves, but I must admit I’m tempted to buy a second pair and go to town on kitbashing them (not something I’d ever do with a Forgeworld model). 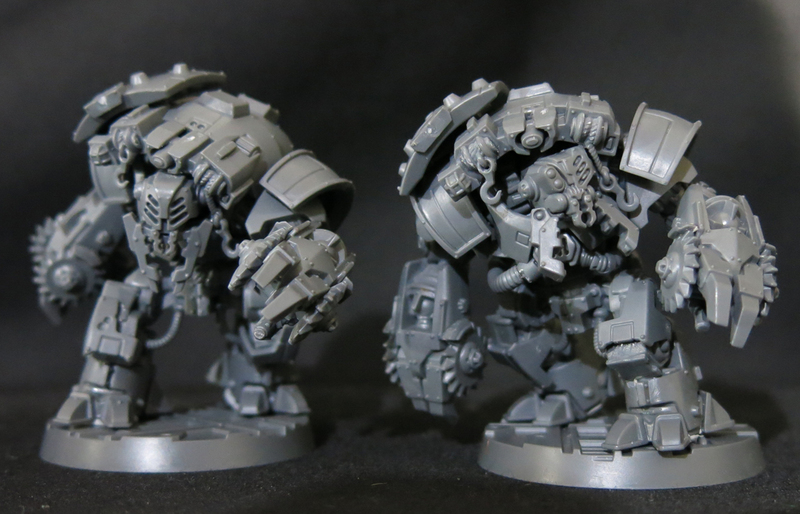 Building the kit according to the instructions (an absolute must with Necromunda models where kits are often so complex that even the neck is separate to the head – hence Neck-romunda) one ends up with four natural subassembles; the legs, torso and each arm. Rather than build the first model to completion then start over with the second I recommend building each one up to the point that the subassembles are complete and then mixing them around to create a pair of unique models. Again, I’ve been fairly conservative with mine so far but I’ve got a lot of ideas brewing so now I’ve built two I’m increasing tempted by another pair with which to go a bit more crazy. Let’s take a look at what I’ve built so far. I’ve already come to think of this one as “Aggressive Ambot” with his lunging pose and powerful grav-fists. There are only two styles of head in the kit, the mandibles of A being moulded to the face whilst those of B are separate. However it certainly wouldn’t be difficult to snip off A’s mandibles and exchange them with those intended for B to create two more unique faces. 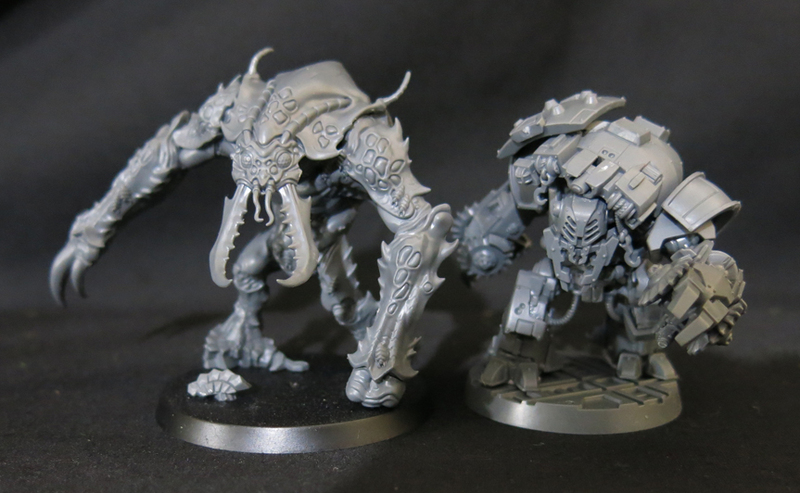 Perhaps not the most exiting shot in the world but I’ve been curious to know what the back of the models looks like, as none of GW’s previews have shown it. Another thing that hasn’t been entirely clear from official previews is exactly how big they are. When faced with a kit like this the first thing that springs to mind is generally a dreadnaught and although I assumed these would be smaller it was still tricky to picture exactly how big they were going to be until they were finished. Thus, for your assistance and edification, here are a few handy size comparisons. 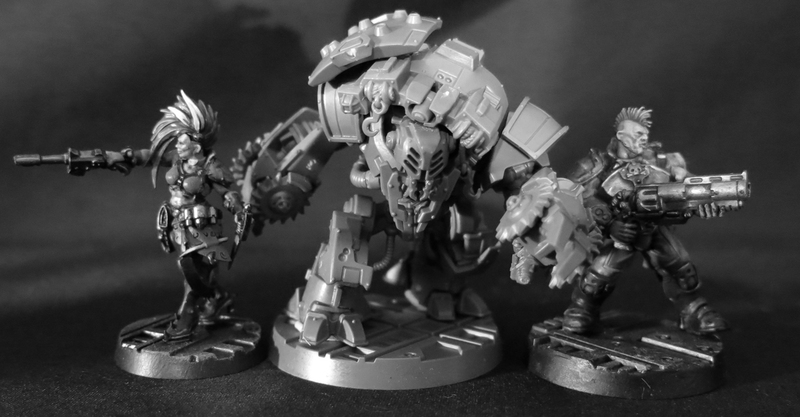 Right now, on the mean streets of the Underhive, these are definitely the biggest dudes around, looming over humble gangers in exactly the way one would expect from a monstrous alien which has been crammed into a deadly robot without the slightest consideration for health and safety. 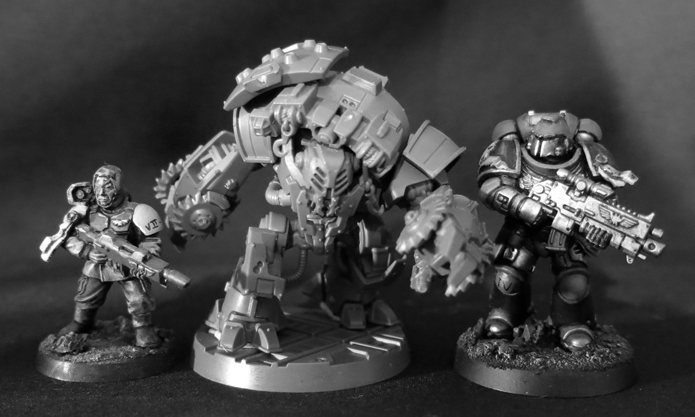 For those whose mindset is associated with the more traditional side of 40k here we see one posing next to those staples of the size-comparison shot; a space marine Intercessor and a humble, if probably terrified, guardsman. 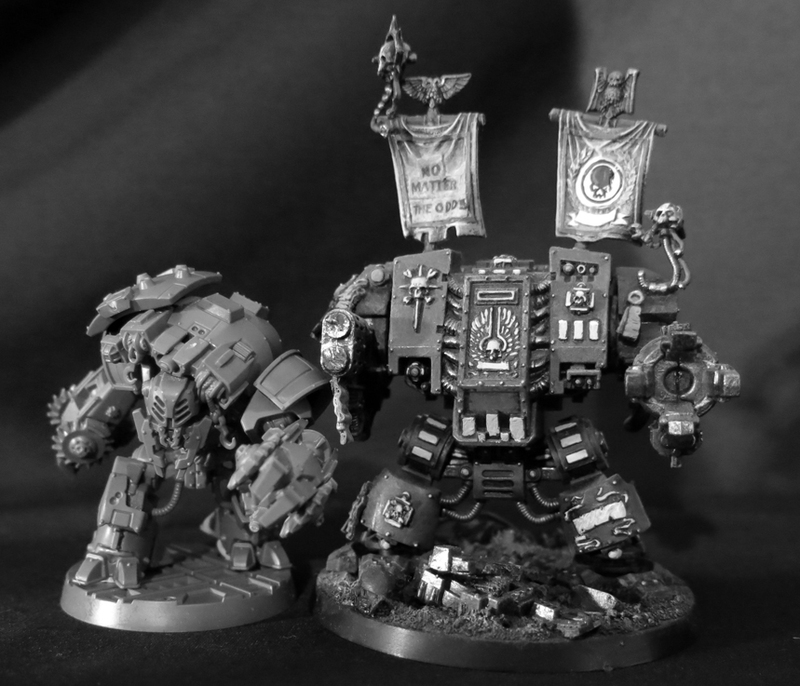 And, just in case I’ve caused any confusion with my earlier comment about dreadnaughts, here one is dwarfed by a dead space marine in a walking coffin. Anyway, hopefully you’ve found this useful and/or entertaining, particularly if you’ve been thinking of getting yourself an Ambot. These won’t get painted for a little while as I need to think up a suitable generic colour scheme to use with them but all being well I should have something painted to show off by later on in the week. 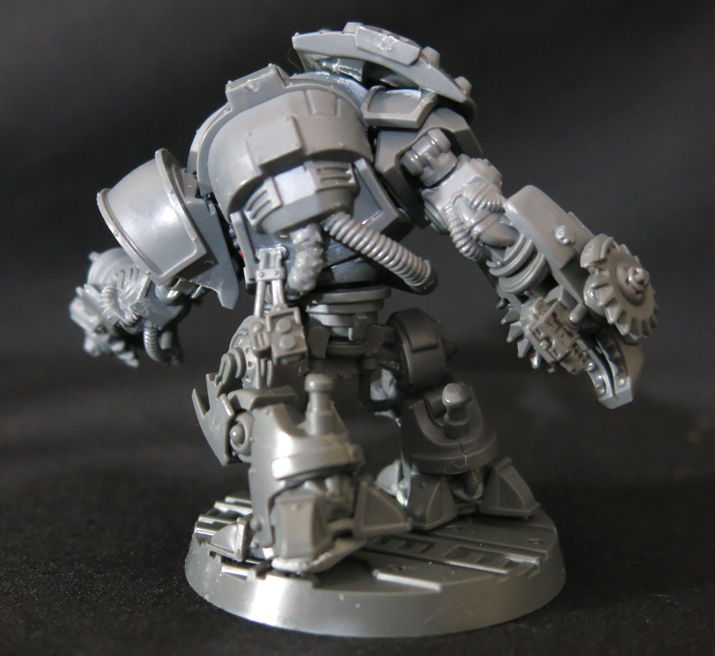 This entry was posted on Monday, March 11th, 2019 at 6:47 am	and tagged with Ambot, Necromunda, Review, Warhammer 40k, WIP and posted in Necromunda. You can follow any responses to this entry through the RSS 2.0 feed. They look good, and like you I had assumed they must be resin. The plastic is a nice surprise. Yeah, it’ll be interesting to see what else they decide to do in plastic. I remember them saying that they were aiming for a plastic release every three months or so, but that wouldn’t always be a new gang, but it didn’t click that it could be things like this. Yeah, I can see this becoming a real workhorse of the Inq28 scene. I know I’ve had a few ideas which I’ve tried to make and ended up shelving over the years which this would be perfect for, so I might well end up getting a second pair and bringing a few of those concepts out of retirement. Waiting to see what else is forthcoming first though. Very cool! Thank you for the scale shots and the pics of the back. And yeah, I can see myself using these, whole or in parts, in all kinds of projects. They are on my must- get list now. Thanks – they’re pretty neat aren’t they? I’ve made mine quite generic for now so they fit in with any of my gangs but I’m definitely curious to see what ends up being done with them. Like the primaris marines the models are very much a blank canvas that can be customised however you want so I reckon soon we’ll see people modifying their appearance to suit their own gangs. I popped into the local games shop today- the had one box left of them so I snapped them up. I’m thinking that just one, let alone two, would give my Van Saars a close combat advantage they are sorely lacking at the moment. Pretty much read my mind on how I was planning to use it. I’ve been gluing up some Delaques so Neck-romunda got me real good! Nice models, and size comparison is always useful. Oh yeah, the Delaques are very cool. 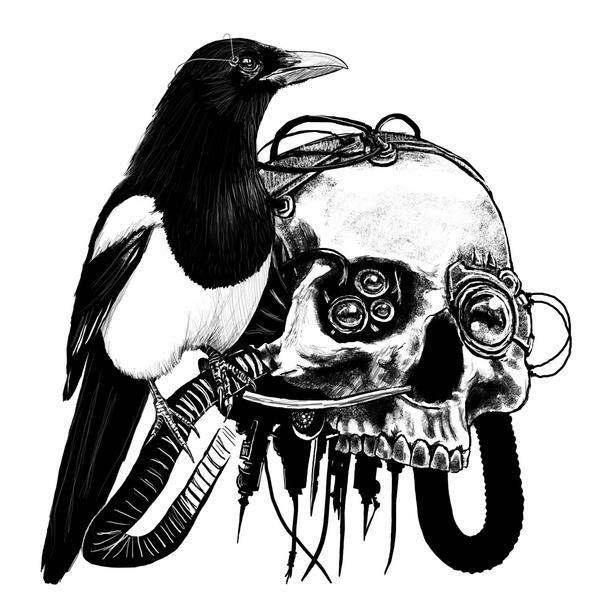 To be honest there’s not been a gang yet which I didn’t like (Van Saar took me a while to get into) but those Delaque – I really had to pick up my jaw off the floor when they appeared. Glad you think the size comparisons are helpful, I’m a sucker for those myself so I reckoned it would be worth while getting them out there. That’s some really cool models. Not quite my cup of tea but cool without a doubt. Aye, I can see it might not be to everyone’s taste (although I really like it myself). The nice thing with it is I can see it being a good “blank canvas” for convertors, much like the Primaris marines. It’ll be very interesting to see what people do with it over the coming months. Head swaps would go a long way for me. Should be fairly easy to do, and would definitely remove the biggest insectile element. Whatever it was replaced with would then define the character of the new model as well.